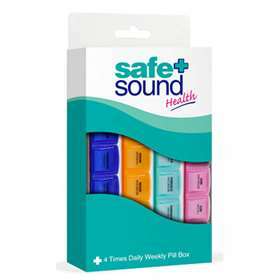 Safe+Sound 4 Times Daily Weekly Pill Box is an ideal way of keeping track of daily medications, vitamins and supplements. To open compartments gently push the lid towards it's hinge with the tip of the thumb or finger before fitting. Snapping the lid closed can damage the retaining lug so always close each lid with care. Wash the entire unit before first and subsequent uses as required, with warm soapy water. Rinse well and dry with a soft cloth. Thoroughly inspect all parts before the first use and subsequent uses to ensure that there are no signs of defects, signs of wear of foreign particles. Replace entire unit immediately if any parts become worn, or if any compartment fails to close securely. Keep all pills and medicine away from children at all times.